With the S160 now in testing and after a refreshing break we have embarked on our next voyage of creation. Something a little more familiar this time from Brunel's Great Western Railway, the GWR 29xx Saint class. The 29xx class was built from a series of 3 prototypes at the start of the 20th century and a total of 77 were produced in 4 distinct groups - Scotts, Ladies, Saints and Courts. The initial batch being built as 4-4-2 they were all converted to (and the later versions built as) 4-6-0 by 1913. The original square frame design was also changed to a curved frame for the Saints and Courts, with many of the earlier locomotives being converted as well. Outside steam pipes were another modification made to some members from 1930 onwards. 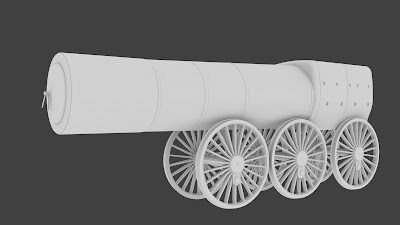 With it's 6 ft 8 1⁄2 in wheels the "29's" (as they were known to their crews) were designed for express passenger work and excelled at this task during the golden age of steam but were limited in their freight duties. In fact when Charles Collett needed a mixed traffic locomotive he decided that a smaller-wheeled version of the Saint class could perform well and he modified No. 2925 Saint Martin with 6 ft driving wheels which become the prototype of the very successful Hall Class. It's not unreasonable to say that the 2900 class became a template for all later 2-cylinder GWR 4-6-0 classes which include the Manor, Grange, and County classes. Although no Saints survived into preservation one is currently being built at Didcot using Maindy Hall as a basis and you can read about the fascinating work at the Lady of Legend website. The intention at Victory Works is to create all of the non-prototype 29xx class (74 in total) in 4-6-0 configuration in both square and curved frame versions, as appropriate, with the GWR Standard No. 1 boiler which most ran with for a majority of their working lives. Normally at VW we like to start with the wheels but this time around we thought we'd start on the boiler. 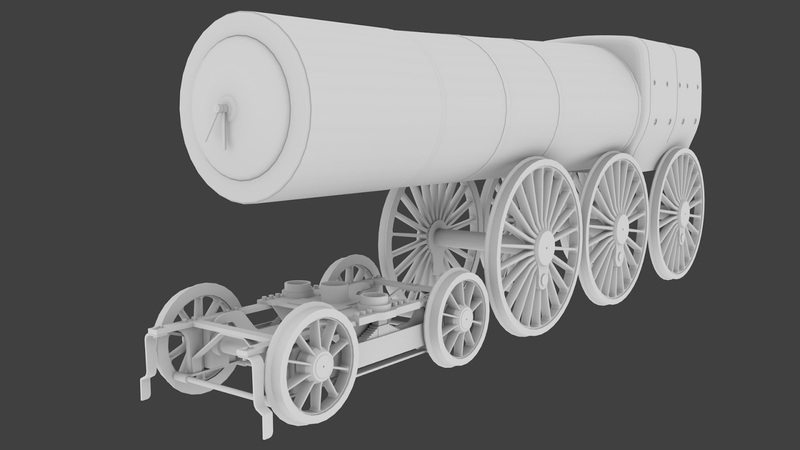 Then we added the large wheels, creating a somewhat unbalanced "cannon" like effect! 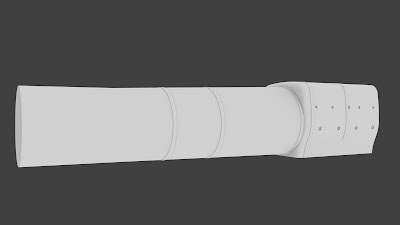 The bogie is quite complex but the detail needs to be there even though much of it will be hidden by the cylinders and frame. 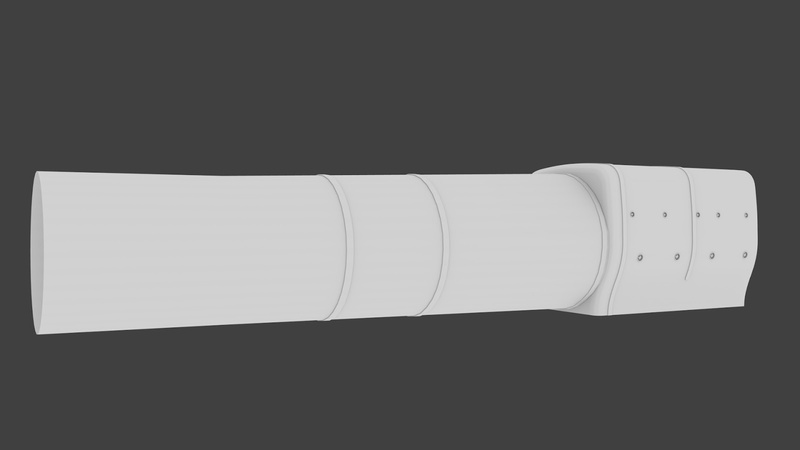 Speaking of cylinders, now was a good time to add them to help with scaling of the other parts and make sure that the overall appearance is correct. The cylinders completed and the beginnings of the square frame and she's starting to look rather Saint'like. 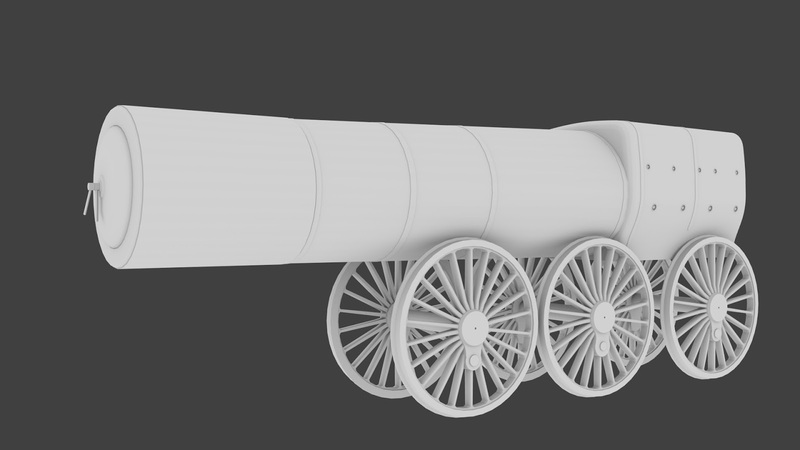 We'll continue to have regular updates as we build the 29xx class. During this time, and whilst waiting for some reference books to arrive, we also wanted to test the concept of the working TPO - Travelling Post Office. For those who are unaware of the system, railway companies in Britain used coaches fitted with arms and nets along with line-side equipment with similar fittings to allow the collection and drop off of mail packets without having to stop the train. Here is a video of the equipment being demonstrated at Didcot. 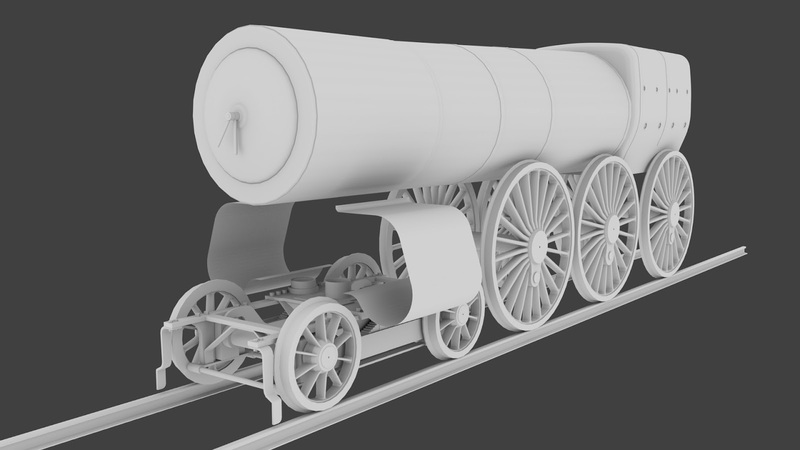 Before we launched into building the coaches we had to make sure that Train Simulator could replicate the effect. I've had working TPO's on my list of wants since building the 56xx back in 2010 and I've gone through half a dozen different ideas on how to do it, all of which failed in some way due to a lack of script calls or non-communication between in-game objects. However 9 months ago I came up with a new solution for it and I'm pleased to say that it has worked as expected. This is the first video checking if a pick up and drop off is even possible. Note: These are proof of concept videos - the K1 is standing in for the as yet unbuilt Saint, the coach is a simple block, the packages are red cubes. The animations are also very rough and simply to test the concept. 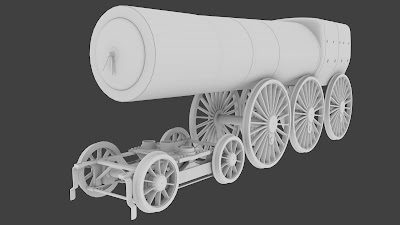 Obviously the final version will be to our usual modelling standards and the animations will carry the full weight of the real packages - this is simply a technical test to see if the transfer is possible. Shortly after this test the reference material arrived and after taking it all in it became clear that the transfer process is not simultaneous. The "drop-offs" are from either side of the 2 doorways, the "pickups" in the net at the rear of the coach. Further reading also revealed that the number of drop-offs and pickups varied by location. From 0 to 4 drop-offs (2 doorways with 2 traductor arms each) and from 0 to 3 pick-ups from the line-side equipment and we hope to allow these choices via a setting on the equipment. The line-side equipment placement will be scenario based, meaning it requires no route modification and can used anywhere. Included scenarios are planned for the "Riviera Line In the Fifties" route which has 5 confirmed TPO line-side equipment locations, and full instructions on set-up will be included in the manual for using the equipment in your own scenarios. So that's it for this week. There will be lots more WIP images as the work progresses. "The 29xx class was built from a series of 3 prototypes at the start of the 21st century"
Corrected! Cheers for pointing that out. Congratulations on getting the TPO concept to work, although I expected you to put something in about the 'Night Mail' program that was shown 80 years ago, even though the documentary was filmed on the LMS. This makes waiting for the terrier even more enjoyable! This looks very exicting! It's like the hornby train set with the working mail coaches and the pick up hook and receiving bin where the little plastic bags go! Will the Saint also include the prototype locomotive, No. 100, with the lever reverser? Also how's the testing on the USATC S160? DTG has been keeping on down low. Thanks. I cannot wait for the Saint to be built! The Saint will come with the square framed variant with the lever reverser and the curved framed variant with the screw reverser. There were some "Frankensteins" that had a mix of the above but we're sticking with those 2 set ups. No. 171 will be included however the first 2 prototypes (No. 's 98 and 100) will not as they were somewhat different and were both scrapped by 1933. Looks very good so far. In terms of the TPOs, is it just going to be the GWR TPOs that are going to be released or will there be different versions later on? 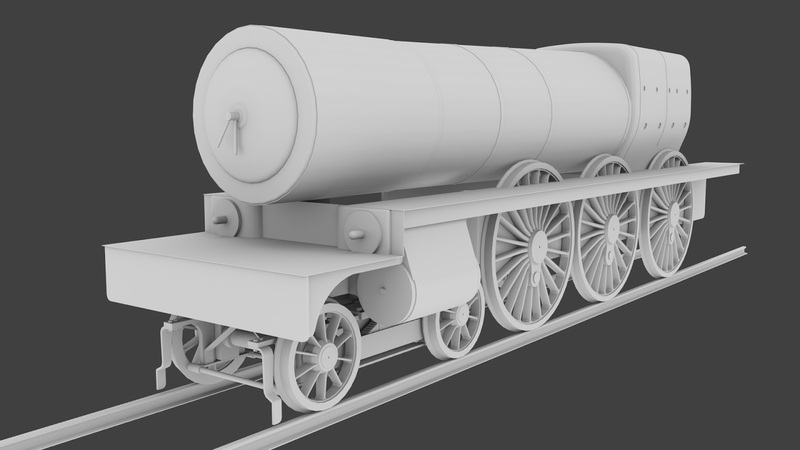 If we build an appropriate loco from another company later on then we can consider TPO's for them as well.